Simon Beaufoy's play of The Full Monty has been so successful that it now heads off on a national UK tour, so are you ready for a debrief? Baring all in The Full Monty are a line-up of well known faces. I caught the show late in 2015 at Malvern Theatres when it first appeared as a Sheffield Theatres production. Since then, it has won the UK Theatre Award for Best Touring Production and the buzz around its UK-wide tour has led to it amassing an advance box office of over £5 million. Theatre-goers at Birmingham Hippodrome, Manchester Opera House, Glasgow's King's Theatre and more are in for a thrill. That's because film screenwriter Simon Beaufoy has done a wonderful job of taking the most memorable scenes from the film and condensing them into this extremely funny yet sentimental piece of theatre. Although there's the comedy of an unlikely group of former steelworkers turned male strippers putting on their first show, the script also tackles grittier topics of how the recession has affected personal relationships in all of their lives, depression and homosexuality. At the heart of this theatre show are all those bits we love - the dancing in the dole queue to song Hot Stuff, the awkward rehearsals and the beautifully choreographed finale (where they really do bare all, ladies); but there's also plenty of delightful surprises and special effects that bring a few gasps. 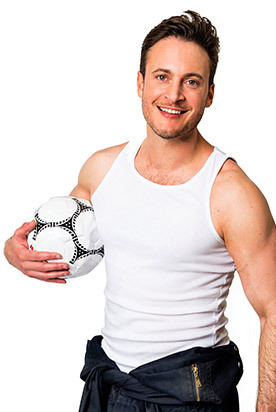 The latest Full Monty tour has much of the same cast as when I saw it and the show is still led by Gary Lucy, of Footballer's Wives and Hollyoaks fame, playing likeable jobseeker Gaz (the role made famous by Robert Carlyle in the film). The Full Monty was Lucy's first stage role and he does it well, with a particularly impressive Northern accent for an Essex boy. Among the actors reprising their roles as Gaz's downtrodden colleagues include Andrew Dunn from BBC show Dinnerladies as Gerald and former Brookside actor Louis Emerick as Horse. When I saw the show, they all had charisma on stage and a good chemistry with each other that made their banter more realistic. Joining them on this tour will also be Chris Fountain as Guy, Kai Owen as Dave and Anthony Lewis as Lomper. 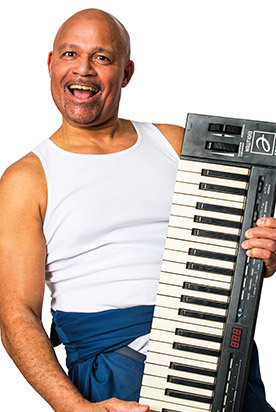 The Full Monty, starring Louis Emerick (pictured) on stage manages to keep the essence of the well-loved film. An advantage of this play is that the touching father and son storyline seems to be explored much more on stage than in the film. The set recreating a derelict steel factory is impressive too. 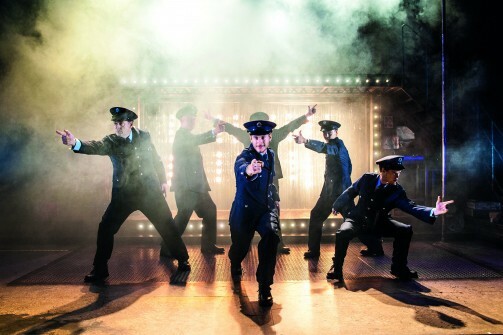 Beaufoy has managed to create a slick, thrilling and well-crafted transfer to stage for The Full Monty that manages to keep the essence of the well-loved original and has earned itself a national tour.